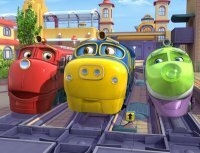 Enter The Chuggington Family Adventure Sweepstakes! My little guy loves trains so I would be excited to win the other great prizes like the DVDs and Books! Ends May 31, 2011.